NOTE: Currently available only in Silver-layered version. See image above. Click to enlarge. 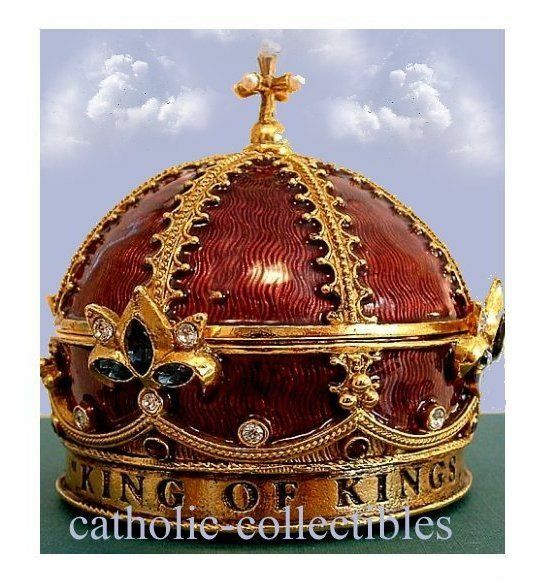 This is a most magnificent rosary box, 24 KT triple-gold layered and adorned with Swarovski crystals, this hand painted Royal Crimson enameled box is handmade with the highest quality materials and the finest in workmanship. 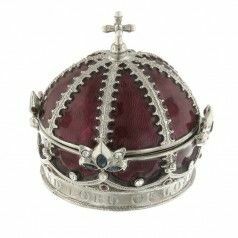 Atop the crown is a dimensional cross, its pearl-ended bars pointing to the far corners of the earth. From it radiate eight golden decorative rays over the Royal Crimson enameled hemisphere. This enamel has a high gloss and almost looks as if it is made of vertical waves of burgundy wine tone threads. The bottom of the box is so exquisite, that words and photographs and scans can not do it justice. 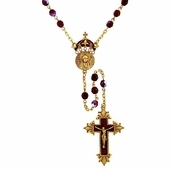 It is bejeweled with four fleur di leis designs comprised of marquis and round Swarovski crystal atop a small pearl, repeated four times around the box with a smaller gold design in between each jeweled fleur di leis. Above the inscription is a wavy gold design with another crystal at each crest alternating with an amethyst crystal beneath the golden wavy band. 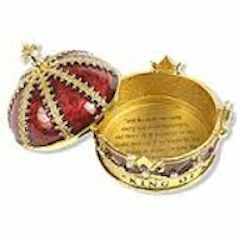 Inscribed at the bottom of the box is KING OF KINGS, and as you turn the box you will see LORD OF LORDS, a reference to 1 Timothy 6:15. 6:13 I charge you in the sight of God, who gives life to all things, and of Christ Jesus, who in his testimony before Pontius Pilate made the good confession; 6:14 That you keep the commandment without spot, free of reproach, until the appearing of our Lord Jesus Christ: 6:15 Which he will bring about in his own time, he who is the blessed and only Sovereign, the King of kings, and Lord of lords. This box would make an outstanding gift, just perfect for Christmas! Handel referred to the Lord as King of Kings and Lord of Lords in his Messiah oratorio referring to the Scripture. 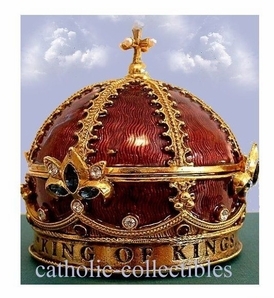 Someone with a devotion to the Infant of Prague will especially appreciate this box which looks like the Crown of the Divine Infant. 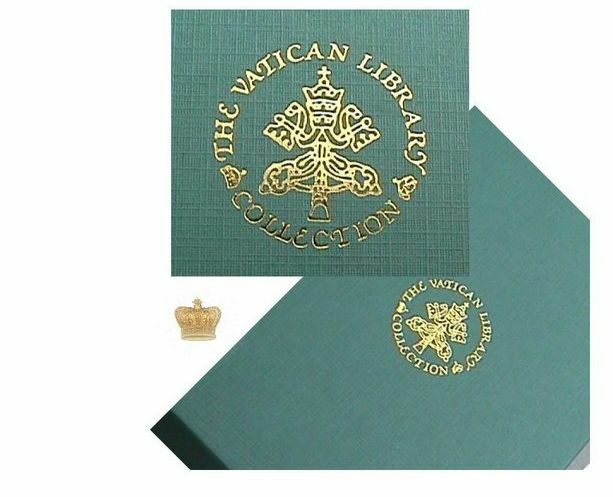 Comes in the distinctive and beautiful green gift box with the gold Vatican Library seal. Exquisite. This rosary box has a matching rosary. Excellent seller.